Coriander, Black Pepper, Clove, Fennel, Sesam Seeds, Aniseeds, Tuj, Dry Ginger, Salt, Turmeric, Chilly & Mango. Chop finely 2-3 Onion and 10-12 Garlic sticks chop one piece of coconut. Boil 200 gm White Peas (Mutter). Heat 2 tbsp. oil in a pan, add onion and garlic mixture, heat for 2 minutes - add 3 tps. 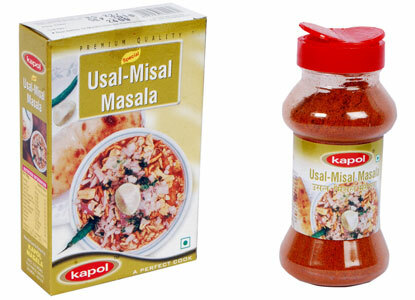 of Kapol Usal-Misal Masala and boiled white peas, heat for 2 minutes. Pour 3 glass of water , salt as per taste and coconut. cook for 15 minutes. Delicious Usal is ready. Misal: Put 25 gm. mix Farsan in a plate - pour one cup of Usal on it . Garnish with chopped onion green coriander, sev and Lime. Serve hot with Pav.